Chevy 1500 truck mud flaps, quality drilless custom mud flaps for Chevy model 1500 trucks. This is a Drill-less Mudflap, approximately 12 inches wide by 3/8 inch thick, designed to hang approximately 9 inches below the fender well. Application: FRONT of all 2001 thru 2007 full-size and 1500 classic style pickups including 4WD. This is a Drill-less Mudflap, approximately 12 inches wide by 3/8 inch thick, designed to hang approximately 11 inches below the fender well. Application: FRONT of all 2001 thru 2007 full-size classic style pickups requiring extra length due to leveling, lift or oversized tires. NOTE: For OverSized Tires that may rub on front mudflap. This is a Drill-less Mudflap, approximately 12 inches wide by 3/8 inch thick, designed to hang approximately 6 inches below the fender well. Application: FRONT of all 2WD 2001 thru 2007 full-size classic style pickups. Application: FRONT of all 2001 thru 2007 1500 classic style 2 wheel drive pickups. This is a Drill-less Mudflap, approximately 14 inches wide by 3/8 inch thick, designed to hang approximately 9 inches below the fender well. Application: FRONT of all 2001 thru 2007 full-size and 1500 classic style pickups with wider tires. Serviceability: This Mudflap is pre-drilled and requires no drilling of additional holes in your truck metal. Allows for easy & precise alignment, and drill-less installation. This a Drill-less Mudflap, approximately 12 inches wide by 3/8 inch thick; designed to hang approximately 10 inches below the fender well. Application: REAR of all 2001 thru 2007 models of 1500 classic style trucks with stock tires and stock suspension. This a Drill-less Mudflap, approximately 12 inches wide by 3/8 inch thick; designed to hang approximately 12 inches below the fender well. Application: FRONT of all 2001 thru 2007 full-size classic style pickups with wider tires including 4WD. This is a Drill-less Mudflap, approximately 14 inches wide by 3/8 inch thick, designed to hang approximately 11 inches below the fender well. Application: FRONT of all 2001 thru 2007 full-size classic style pickups requiring extra width and length due to leveling, lift or oversized tires. Application: REAR of all 2001 thru 2007 models of full-size classic style trucks with stock tires & stock suspension that require addition protection of towable. This a Drill-less Mudflap, 14 inches wide by 3/8 inch thick; designed to hang approximately 14 inches below the fender well. NOTE* Trucks with tires extending more than 1″ beyond fender, phone in order. Serviceability: Popular Mudflap for lifted trucks with oversize wheels, offers great protection for your truck and your towable. It fits higher into the wheel well for extra protection. Pre-drilled and requires no drilling of additional holes in your truck. Allows for easy & precise alignment, and drill-less installation. This is a Drill-less Mudflap, approximately 12 inches wide by 3/8 inch thick, designed to hang approximately 6 inches below the fenderwell. Application: FRONT of all 2007 thru 2013 1500 pickups. This is a Drill-less Mudflap, approximately 14 inches wide by 3/8 inch thick, designed to hang approximately 9 inches below the fenderwell. Application: FRONT of all 2007 thru 2013 1500 pickups with wider tires.. This a Drill-less Mudflap, approximately 12 inches wide by 3/8 inch thick; designed to hang approximately 9 inches below the fender well. Application: REAR of all 2007 thru 2013 models of 1500 trucks with stock tires and stock suspension. Application: REAR of all 2007 to 2013 1500 pickups with oversize wheels. 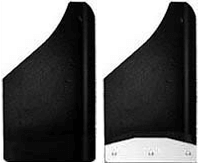 This is a Drill-less Mudflap, approximately 12 inches wide by 3/8 inch thick, designed to hang approximately 5.5 inches below the fender well. Application: FRONT of all stock 2014 thru 2018 Chevrolet 1500 pickups. Chevy Mud Flap is a Drill-less Mudflap, approximately 12 inches wide by 3/8 inch thick, designed to hang approximately 8 inches below the fender well. Application: FRONT of all stock 2019 – current Chevrolet 1500 pickups. Mounting: DuraFlap mounting hardware is made of stainless steel where available. Other mounting products are made of anti-corrosive and rust resistant materials. Our drill-less Mudflaps are custom designed to utilize existing factory holes and other mounting points available on your truck. Instructions included. Includes plug for fender well side hole. This is a Drill-less Mudflap, approximately 12 inches wide by 3/8 inch thick, designed to hang approximately 7.5 inches below the fender well. Application: FRONT of all 2014 thru 2018 Chevrolet 1500 pickups with a slight lift or leveling kit. We suggest that you measure to make sure this mud flap will be at least 6” off the ground, and your tires will not rub on this mud flap hanging inside your fender well when turning the wheel. 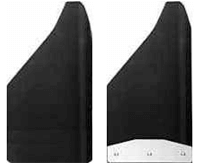 Chevy mud flap is a Drill-less Mudflap, approximately 12 inches wide by 3/8 inch thick, designed to hang approximately 710 inches below the fender well. Application: FRONT of all 2019-current Chevrolet 1500 pickups with a slight lift or leveling kit. We suggest that you measure to make sure this mud flap will be at least 6” off the ground, and your tires will not rub on this mud flap hanging inside your fender well when turning the wheel. Chevy Mud Flap is a Drill-less Mudflap, approximately 14 inches wide by 3/8 inch thick, designed to hang approximately 5.5 inches below the fender well. Application: FRONT of all 2014 thru 2018 Chevrolet 1500 pickups with over sized tires. We suggest that you measure to make sure this mud flap will be at least 6” off the ground, and your tires will not rub on this mud flap hanging inside your fender well when turning the wheel. If there is a rub issue, please go to our Lifted Truck page. Chevy Mud Flap is a Drill-less Mudflap, approximately 14 inches wide by 3/8 inch thick, designed to hang approximately 8 inches below the fender well. Application: FRONT of all 2019 – current Chevrolet 1500 pickups with over sized tires. We suggest that you measure to make sure this mud flap will be at least 6” off the ground, and your tires will not rub on this mud flap hanging inside your fender well when turning the wheel. If there is a rub issue, please go to our Lifted Truck page. Mounting: DuraFlap mounting hardware is made of stainless steel where available. Other mounting products are made of anti-corrosive and rust resistant materials. Our drill-less Mudflaps are custom designed to utilize existing factory holes and other mounting points available on your truck. Instructions included. Includes a plug for the hole in the side of the front fender well. This is a Drill-less Mudflap, approximately 14 inches wide by 3/8 inch thick, designed to hang approximately 7.5 inches below the fender well. Application: FRONT of all 2014 thru 2018 Chevrolet 1500 pickups with oversized tires and a slight lift. We suggest that you measure to make sure this mud flap will be at least 6” off the ground, and your tires will not rub on this mud flap hanging inside your fender well when turning the wheel. If there is a rub issue, please go to our Lifted Truck page. Chevy Mud Flap is a Drill-less Mudflap, approximately 14 inches wide by 3/8 inch thick, designed to hang approximately 10 inches below the fender well. Application: FRONT of all 2019 – current Chevrolet 1500 pickups with over sized tires and a slight lift. We suggest that you measure to make sure this mud flap will be at least 6” off the ground, and your tires will not rub on this mud flap hanging inside your fender well when turning the wheel. If there is a rub issue, please go to our Lifted Truck page. Mounting: DuraFlap mounting hardware is made of stainless steel where available. Other mounting products are made of anti-corrosive and rust resistant materials. Our drill-less Mudflaps are custom designed to utilize existing factory holes and other mounting points available on your truck. Instructions included. Includes a plug for hole in the side of the front fender.